Kinsley had the Valentine's Day of a lifetime when her dad surprised with a dress-up father-daughter dinner date. SHREVEPORT, La. — Ashley Clark had plenty to be thankful for as Valentine's Day approached this year. She has a husband and she has a daughter, all three of whom call Louisiana home. She has a good job and an even better home — but most importantly, she has a husband who provides for her daughter. Wednesday, Clark posted a tribute on Facebook to her daughter, Kinsley, and her husband, Detric. "I never had the perfect daddy figure in my life. I saw and heard a lot of things a girl shouldn't have saw or heard from her dad," said Clark in the Facebook post. "But one thing for sure is I can honestly say I broke that cycle with my child." To Kinsley's surprise, Detric laid out heart-shaped paper petals, a card, a navy dress and black dress shoes on her bed. "Hello My beautiful Princess get dress I'm taking you to you favorite spot — daddy [sic]," read the card. Kinsley covered her mouth and her eyes as she followed along with the card. Then, with her slick black dress shoes, her navy dress and an accompanying black purse, Kinsley turned around the corner of the hallway to see her father down on one knee, rose in hand. Kinsley grabbed the rose and rushed in for a larger than life hug. 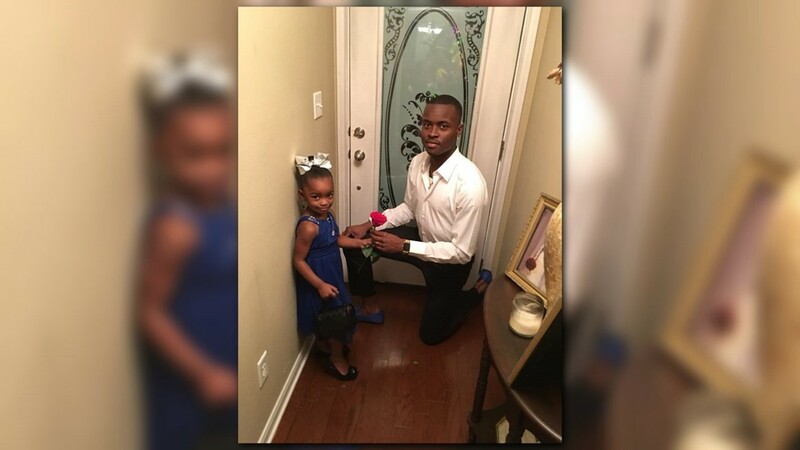 "[Detric] decided he would take our princess on a real date and show her how a man is supposed to treat a lady so when she grows up she will accept nothing less," said Ashley. The father and daughter duo then arrived at Kinsley's favorite eatery, a pizzeria, where Detric helped take her coat off and, of course, pulled out her chair. She was treated with food, love and a kiss on the hand. She was his princess. "He's the best, hands down," said Ashley. Happy belated Valentine's Day, Kinsley.